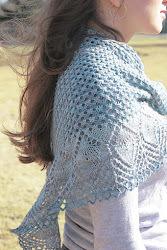 psst: Julie is doing a Lucky Penny Baby giveaway on her blog! Go check it out and then come right back! 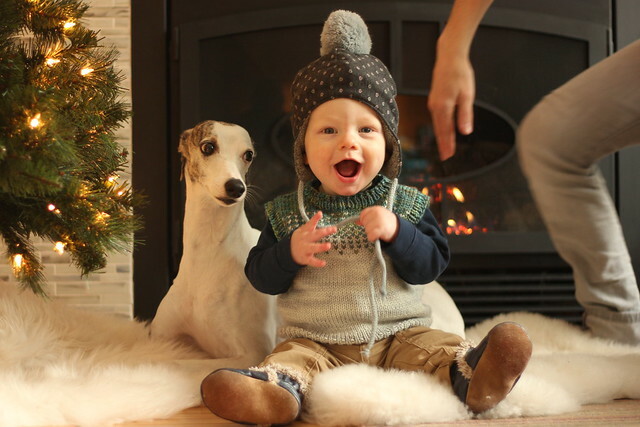 This photo was an out take from our Christmas card photo shoot. I love the expression on Rowan's face, but don't love that I wasn't able to scurry out of the frame quick enough! 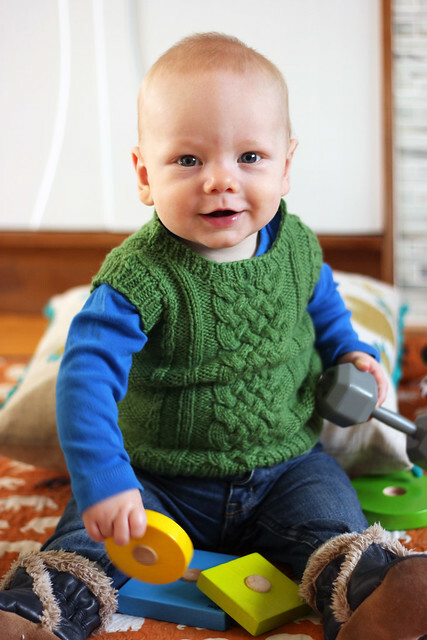 In my humble opinion no baby’s knit wardrobe is complete without a knitted vest. 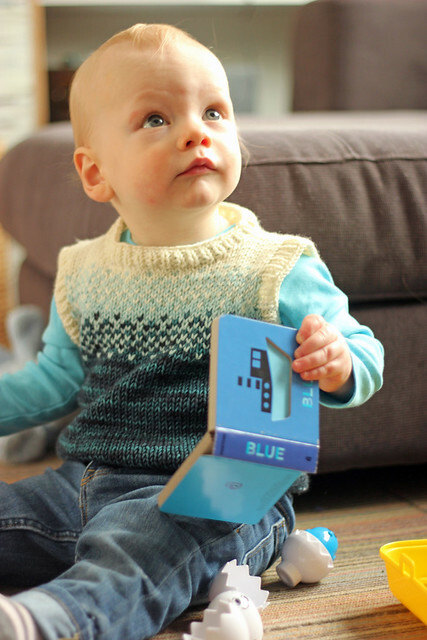 Not only are they quick to knit, they happen to be one of the most practical baby knits out there. They keep the body warm while allowing all the frantic arm flailing and Cheerio throwing that little ones love to do. 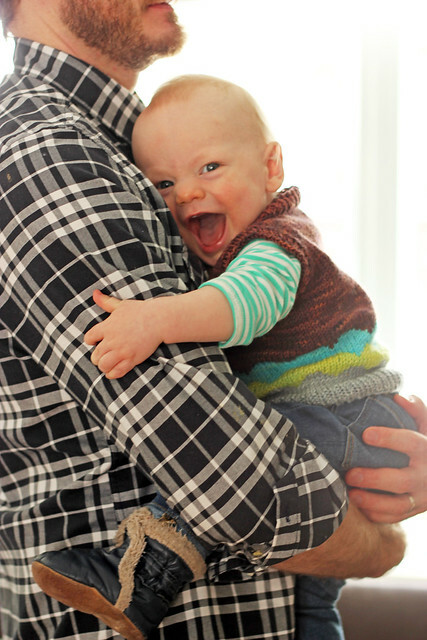 As an added bonus, your baby will look super smart when he’s sporting his scholarly sweater vest. 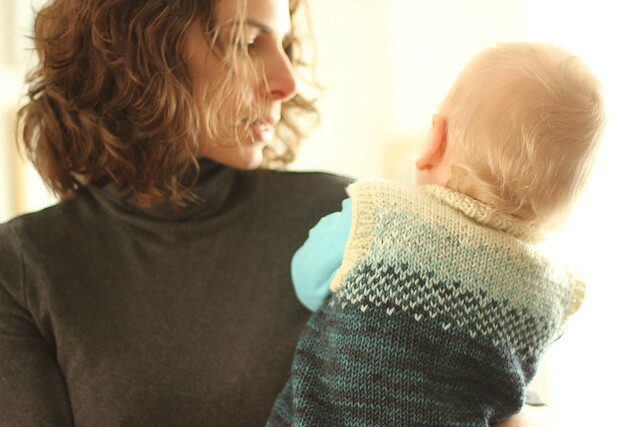 Ok, so the above photo does not feature my new Schoolboy Vest pattern, it is the Master Charles pattern knit for Rowan by my dear online friend CelticCastOn. This vest arrived in the mail shortly after Rowan was born last April. I cooed over it (because it's so cute) and then put it away because it wouldn't fit him until the fall. When fall rolled around I pulled it out, put it on Rowan, and the rest is history. I am very, VERY much a vest person when it comes to Rowan, and I never would have known it were it not for Kelly's awesome gift. So thanks Kelly! I love vests on babies because they are just so easy. They are adorable over a onesie, but let's be honest, what's not adorable over a onesie? 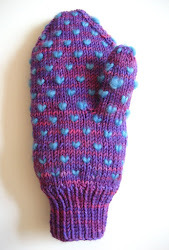 The real key for me is that they keep baby warm, but you never have to fuss with making sure that their sleeves aren't bunching up under the sweater, or worry at meal time that they are dragging the cuff of their beautifully hand knit cardigan through their pureed sweet potatoes. 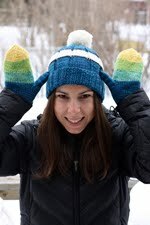 Plus, when it comes to the knitting, it's basically as quick as a hat! 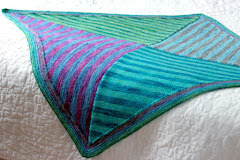 A simple tube, a little back and forth and then voila, a vest. 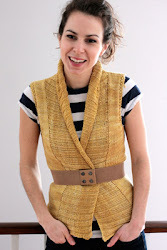 As you can tell from the variety of vest patterning shown in this post (there are three different colourwork versions of my Schoolboy Vest pattern here), the possibilities for adding your own favourite motifs are wide open. The pattern provides you with the chart for the version shown below, but adapting your favourite fair isle pattern for the body of the vest would be a piece of cake. In case you haven't noticed, this vest features the same colourwork motif as the Frosted Alpine hat! The two together would make an adorable baby shower gift, don't ya think?